Volatility refers to the frequency and severity with which the market price of an investment fluctuates. Certain psychological studies have shown that investors as a whole are happiest when volatility is lowest, even if that means making less money over time. 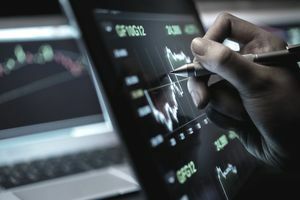 This irrational obsession with market price only manifest itself in items such as publicly traded stocks, bonds, mutual funds, and stock options. After all, have you ever heard of a farmer requesting daily appraisals on his land? A songwriter demanding daily valuations of his or her copyrights? A small business owner constantly paying an accounting firm to calculate the resale value of his firm? Of course not! Yet, when it comes to owning a piece of a business, a share of stock, inexperienced investors pay attention to what other people are doing on a day-by-day or even minute-by-minute basis, selling as their shares fall and buying as they rise; a recipe for certain disaster. This situation is so bad, studies of mutual fund returns have demonstrated that in periods when the underlying funds compounded at 9%, 10%, and 11%, the individual investors only enjoyed 2%, 3%, and 4% returns because they were so shaken by volatility, they constantly bought and sold their positions rather than sitting back and regular acquiring more ownership. It is possible to make money from volatility. Value investors seek to buy assets when no one else wants them. Certain types of option traders make much higher profits when fear is rampant because people are willing to pay them more to write derivatives such as put options. In fact, it may be fair to say that the more professional and intelligent an investors, the more beneficial volatility is to him because he can use it to buy more of what is cheap and sell more of what is expensive. Investors in the oil majors are paid to absorb volatility whether they realize it or not, as a class experiencing market-beating returns since the S&P 500 was unveiled back in 1957 but at the expense of sometimes having to sit on 50%+ losses for 3, 5, or 7+ years..
For long-term investors regularly putting away money through a dollar cost averaging plan, volatility is not particularly meaningful. The regular contributions should even out the average price paid, over the course of many years, so that it becomes little more than a footnote in the history of your financial life. Most folks can't do it, though. Warren Buffett and Charlie Munger once remarked that no matter how many times people said they were going to stick to a plan, experience had demonstrated time and again, decade after decade, certain people were going to pile in during booms and sell out during busts, unable to constrain their worst impulses.